HiYa, Happy Caturday. It is bright and sunny here today. That is making both me and mum happy. We are both sitting in the sunshine, soaking up the goodness. The weather guessers say it is supposed to be giving us white stuff tonight and tomorrow. This is what our front yard looks like now, purrty bare in spots. Yes mum still has the Christmouse lights up and she still runs them as well. She likes the purrty lights, so I humor her. Mum was out and about early and got all the food stuffs, she came home with more flowers. Unlike last week, these are not toxic to us kitties. Mum made a faux-paw last week with the two-lips, so she was happy I didn't mess with them. Purrty colors, mum even got out her fancy iris vase for them. Then off to the flower sitting spot in the living room. Yes I see them up there, yes they are all purrty. I will just see if I can reach them, there is this dangley leaf on this one side. OK, enuf, I will just sit here and watch them while I soak in the sun puddles. Happy weekend, stay warm, safe and hope your team wins. Mum and me don't really care! Hello and Welcome to Garden Thursday with Virginger and Glimmer. We haven't been around in a while winter hasn't been furry bad. No big snow storms, unlike some other places. We hope we don't get any big storms. Not super cold either like last year. We can tell the daylight time is getting longer. We all like that. Winter is our down time. Earlier in the winter mum got these pictures. We heard Mr Blue Jay and mum found him in the tree with the flashy box. Then he dropped in to get a few snacks. Mr Blue Jay doesn't visit very often. He is a purrty big bird! Enough to snack on for all of us. Mum sometimes wonder if Derby is an Angel or Devil now. He was such a sassy boy that she can see him hanging out with basement cat. What do you think Derby ended up as? Unlike Derby I do not meet mum at the door when she comes home from day hunting. I am usually too bizzy watching fevvers out the back. Mum is getting home just about as it gets dark. At that same time all the mourning doves think it is time to get one last drink. So I am usually sitting there chittering away and the fevvers! We had an introoder cat on Sunday. This is the same kittie we see cruising around the area. It was cold out yesterday, so I hopes it wasn't out long. You may need to biggify the pictureres to pick out the kittie. Mum was shooting pictures through the screen window and sort of a glare on the window. But I know you really want to see a picture of ME! I will skip the out takes this week. It is snowing lightly, furry windy and therefore cold. Mum says we are going to stay inside cuddle today! Sounds good to me. This is a blog hop sponsered by The Cat on My Head. Go visit! HiYa! Ducky here. Having a suntastic morning! Bright and cheery out! I like that, mum does too. Mum already did all of her shoppings for the weekend. Stocked up on what foods we needed and then brought home something PINK. Tulips and not from outside. Too cold for that, these came from the store. Checking them out as she first put them in the container in the kitch-hen. Mum then put them up by the clock, so then I had to check them out again. Ginger and pink, yeah, they go together pretty good. Mum was happy just to see me sniff at them and not try to knock them down or eat them. Derby used to try to do both. So iffin I don't mess with these, maybe mum will buy herself more flowers when she wants. That is enuf checking them out. Got other things to do today. Like check out mum's brekkie, a strawberry, cream cheese filled croisassant. Mum said it was yummy. Hope you get sun puddles to nap in today, I did. Enjoy the weekend. 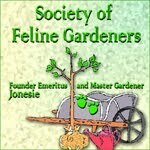 Another year has rolled around to "Ask Your Beans Questions", so here I go! Ducky: HiYa Mum. All comfy sitting here? Mum: Yes Ducky I am all comfy. Ducky: Good. When are you going to take down the Christmouse lights outside? Mum: Not sure. I still have them lit so when I come home it is bright outside our house. Makes things a bit more cheery on these cold, cloudy winter days. Ducky: Do you miss Derby? Mum: Yes I do and I always will. Although I don't miss having to clean up his yaks off the carpet! The place is a bit cleaner these days. I don't have to haul out the carpet cleaner all the time. Even the litter boxes are easier to clean, you don't produce as much output! Ducky: Will you promise me that I will always be an only cat going forward? Mum: No, I won't promise that. For now you get to be an only cat. But should you get lonely you might want a fursib to play with at some point. Plus there are so may kitties who do need good homes, that maybe one would fit in here with us. Ducky: Do you mind it when I come into the sleepy spot with you at night? Mum: No, it is nice to have you cuddle up with me. Although sometimes I wake up because of you putting off so much heat. Just like a hot water bottle! Ducky: Sorry, you know we cats are just a bit hotter than you beans. So that is why you get up to walk around a bit? Cool off? Mum:Yeah, gotta cool down. I don't sleep well if I am too warm, but don't stop coming in to cuddle I would miss that. I gotta give my little mancat some loves! Ducky: Aww mum! Hey, thanks for answering my questions! Taken right after the interview! Mum was still smiling! Yeah, we cats think of all sorts of stuff. Nip, birds, naps, cuddles, treats and bunches more, all at the same time. Mum gave me some stinky goodness over the weekend. I did go back to finish this shortly after mum took the picture. Yes, mum did give me a pawdicure on Sunday, after the game was over. But she just takes a tiny bit off, just enuf to take she sharp point off. The Pack will not be playing in the Stouper Bowl. They played well for most of the game BUT, they didn't play well ALL of the game. So even though it went to OT, they just couldn't pull it out. Seems like the defense forgot to play the last half. Oh well, now mum won't have to plan a party for me to host! The second game, which mum did not watch, the guys name Pat won and won big, so they will play the Hawk guys in the Stouper Bowl. OK, I am going to try this, be brave and stick my paw in the water, so to speak. It looks easier than it is. Gotta actually want to sit in front of the flashy box. No, bad shot, not really in focus, mum's hand is in the way. Although relaxed getting scritches. Dat's better, pretty much in focus, get to see all of my cute face, and I didn't really cut off my ears! SCORE! So iffin you want to join in, do so. 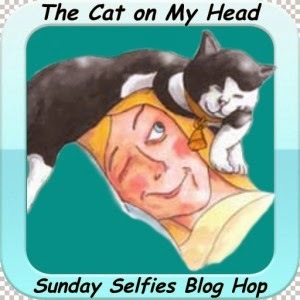 The is hosted by The Cat on My Head as a blog hop, so don't furrgit to leave your linkie there! Oh happy day, it is Caturday. The sun is out and it is getting a little bit warms out. It is already above freezing. Mum hopes the last of the snow will melt out of the driveway today and she didn't have to chop at it. Me and mum started the day slowly, we had nice cuddles afore she got out of the sleepy spot, then we moved to the chair to do some bird TV watching. Mum says she needs to clean out the birdy bath today, they got it all messy. So this is what I am doing for now, will enjoy the sunpuddles and watch mum work. Then hopefully will get some play time later. After mum gets her chores done, the laundry and making a new soup recipe, Vegetarian Corn Chowder. Me checking out mum's brekkie plate, nothing fancy, just raisin bread toast with a little bit of butter. I spied the flashy box strap, must attack the flashy box strap! Mum says something about needing a pawdicure. Mum and me have started a new fun time at her bedtime. We do two things. First she tosses my fav mousie toy, I chase and pounce on it. Then, at least for a few times, I bring it back to mum and she tosses it again. Once I quit bringing the mousie back, Mr Red Dot appears. I race around the dark room or even on top of the bed and mum, trying to catch that dot. Sorry no pics, mum is too bizzy tossing mousies and then it is all dark! Fun times kitties. Hey, mum saw this on FB, so now that she is home, will let me, Ducky post about my little rubber duckies! Our four ducks that came from Laila and Minchie. They even float on the water, iffin we wanted to play with them in the sink or bath. Nah, I don't wanna get wet.